Ok. Apologies for the post delay! I’ve been busy shopping up a storm in Lahore! On the first day, my sister and I went to Anarkali. 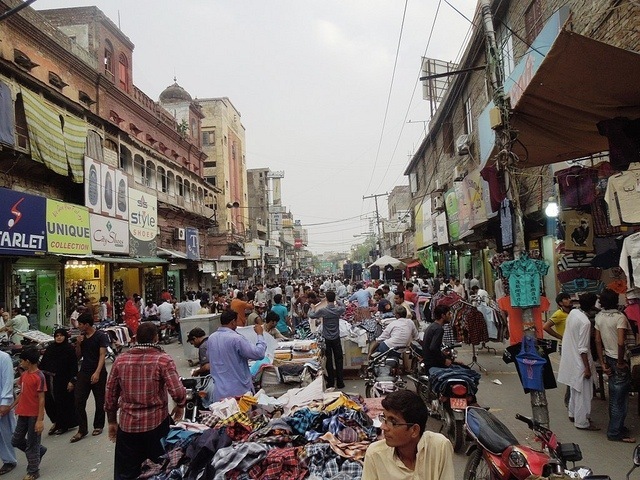 Anarkali is a bazaar in old, inner city Lahore and the best way to do Anarkali is by rickshaw. The bazaar is where you find authentic Pakistani goods- everything from handicrafts to sports and games, clothing and traditional jewelry. It’s busy, a bit of a maze, loud, colorful and you may just get hit by a motorbike driven by a man with a long period accompanied by his wife in a niqab sitting side straddle, while walking through the streets of the bazaar! From Anarkali, I got choorian, which are traditional bangles, because thats where you get the best deals in the city – and I have 8 bridesmaids that I’m gifting 2 sets of choorian to! I also picked up some children’s clothes and toys and handicrafts as gifts for my family in Toronto. I also got a great kameez (long shirt) for myself – for 800 rupees – that’s 8 bucks! Being in Anarkali felt like I was back in Pakistan – real Pakistan! A world apart, then, is where I shopped today – Defence. Defence is a very posh area of the city – here the women in abayas and niqabs that you see in Anarkali are replaced by fashionable young women dressed in both the latest Pakistani and Western designer wear. In Defense, I had my first appointment with a Pakistani designer – Karma. Which I will continue to cover in tomorrow’s post because I’m all of a sudden so sleepy and have another big day of shopping ahead of me!